I got back in from Trondheim yesterday to Oslo after a fantastic weekend with my new team. I feel very blessed to say that I have found myself amongst a team with just wonderful spirit, and great personalities. There are a lot of foreigners, but whats cool is that everyone mixes in together, foreigners and non, and its just really cool that after only 3 games with this team, I feel like I have known them forever. There are 4 Americans, me, and then a Portguese icon named Edite Fernades, and a Serbian icon, Vanja Stefanovic. Its again just so cool chatting to people and getting to know them better and learn about all the different worlds we come from. 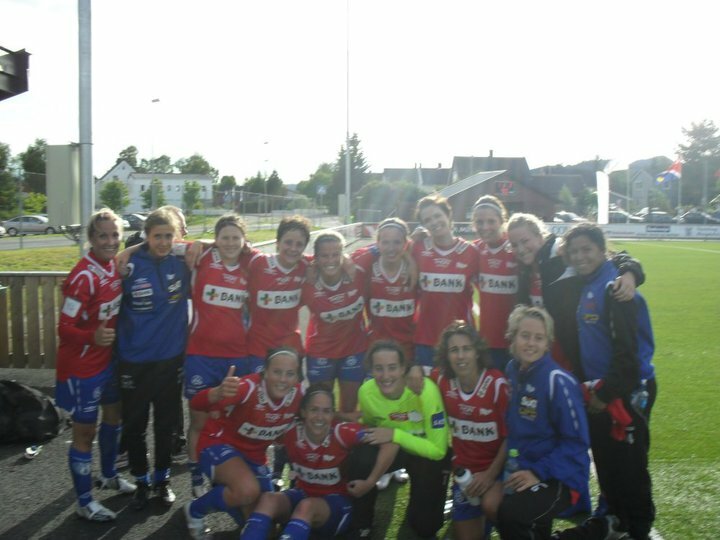 Well we had a very important game on the weekend in our quest to be the first Toppserien team in the last 4 years to come up from the 1st division and last for more than a year in the Toppserien. We won against Kattem 2-1. It was a pretty painful game to be a part of, as it felt more like a rugby match as opposed to a soccer game. Personally for me, I get so frustrated when people dont have that fight in their game, getting stuck in for tackles and the like, but it got better as the game went on. Lena, who is from Trondheim, came on and scored a corner kick that I think half of us had turned on because we thought it had gone out, but it took a weird swerve into the side netting, which we were happy to take. The second goal came from a great half volley by Kelsey off of a corner. She plays defensive center mid for us, and I think she is a fantastic player, so it was nice to see her get on the scoreboard.